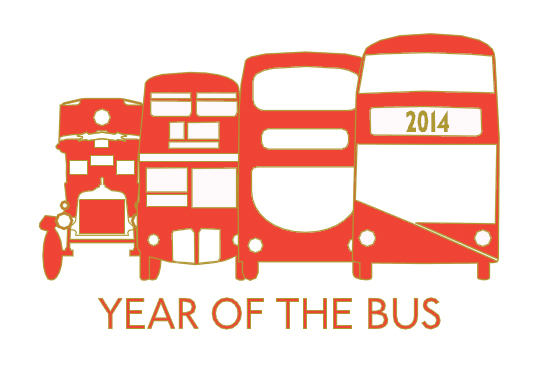 Did you know that 2014 is the Year of the Bus? The London Transport Museum and Transport for London are working together this year to promote London’s bus network and ‘remind the world of the incredible role it plays in this great city’ (TfL). They’ve painted one of Boris’s Buses silver for the occasion and are running a variety of events throughout the year including talks, garage open days, exhibitions and more. Most exciting (probably) is the logo which features on a pin badge issued to all London Bus drivers and a special edition Oyster card. I also really enjoyed these videos about people’s personal experiences of buses, produced for the project on TfL’s website. You can submit your own reasons for loving your bus by emailing: LoveYourBus@tfl.gov.uk. Meanwhile, the London Transport Museum wants to explore 3 themes: Heritage (as per the anniversaries above), People (everyone involved in delivery the bus service in London) and Economy and Innovation ( the economic contribution of buses). Their website lists some interesting ‘bus facts’, my favourite fact being that 96% of London households are within a 400m / 5 minute walk of their local bus service. At the centre of their celebrations will be the restoration of a B-Type bus in khaki livery to commemorate the First World War Centenary. Funded by the Heritage Lottery Fund and Friends of London Transport Museum, the project ‘Battle Bus’ will deliver the restored vehicle for use in various events later in the year.